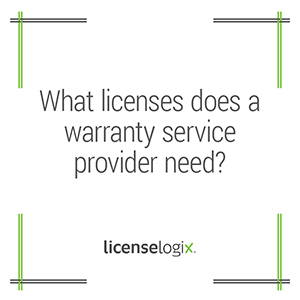 What licenses does a warranty service provider need? Some states have a general service warranty license, others have a home warranty license, and yet others have a vehicle warranty license. In some states, one license covers all three types of warranties, while in others each type of warranty service requires its own license. States regulate warranty providers for the protection of consumers. The main goal of the state is to ensure consumers are not being taken advantage of by businesses. By requiring licensure, the state is able to effectively monitor the company’s transactions. When a consumer has an issue, the state offers protection that would otherwise be unavailable if the industry were not regulated. A service warranty is a contract or agreement whereby a service contract provider undertakes, for a specified period of time, to repair, replace, maintain, or indemnify such services. These licenses are normally governed by the state department of insurance. Most applications require documentation of a company’s reimbursement insurance policy, financial statements, and proof of business entity formation and/or foreign qualification. The license often must be renewed annually or biennially, depending on the state. In most states, it is illegal to provide service warranties without obtaining a license at least 30 days in advance from the start of business. Please contact us regarding specific state requirements. Home warranties are a common type of warranty subject to licensure. Like general service warranties, a home warranty provider agrees to undertake, for a specified period of time, to repair, replace, maintain, or indemnify specific services related to home care. Massachusetts has a separate license for a home contract provider that is governed by the Division of Insurance. The license fee is $600 and must be renewed annually. In addition to the application, a home warranty provider must often provide proof of a funded reserve account, a security deposit, and financial documents showing net worth. Vehicle service contracts are agreements for a specific duration to repair, place, maintain a vehicle where there is operational or structural failure due to a defect in materials, workmanship, or due to normal wear and tear. Applications for vehicle service warranty provider licenses often require corporate documents, reimbursement insurance policies, and financial statements. These licenses are usually renewed annually. Alabama requires a Vehicle Protection Product Warrantor Registration License for companies providing vehicle warranties. The license is regulated through the Alabama Department of Insurance and has a $250 fee. In addition to the initial application, corporate documents, a certificate of good standing, financial security documents (reimbursement insurance policies or $50 million net worth), copies of existing contracts, examination agreements, and biographical affidavits are all required. Arizona is one of the few states that combine a service warranty, home warranty, and vehicle warranty provider services all into one license. The Department of Insurance regulates the Service Company Permit application, which requires a $300 fee. Attachments include a certificate of good standing, biographical affidavit for each owner and officer, proof of $100,000 net worth or surety bond for $100,000. Copies of all service contracts must also be submitted with the application. There is an annual renewal requirement. LicenseLogix will help warranty service providers obtain all of the licenses and registrations required, minimizing time-consuming and costly delays. If you are already licensed, we can file renewals and manage ongoing compliance. For additional help you can fill in the form on the bottom or give us a call at (800) 292-0909. Fill in the brief information form to the right and we will contact you to discuss your licensing needs - with no obligation! Your personal information is only used to contact you. We never sell or share your information.